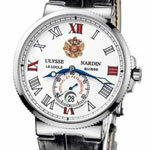 Ulysse Nardin has introduced an elegant new collection into the brands collective. The Classico watch collection, for the time being, is only being produced in 18 carat gold. Reminiscent of other Ulysee Nardin creations, including the discontinued Ulysse I model, the Classico has a "classic" look with beautiful scarab-style lugs. The mens' version of the Classico watch measures 40 mm in diameter while the ladies measures a nice 35 mm in diameter, not a bad size and certainly not a delicate watch by most standards. The mens version will be available in both 18 carat rose and white gold, each with a highly polished finish. 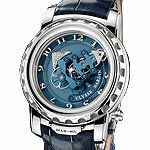 The dials will come in either black or a silvered dial and the white gold version will have a Ulysse Nardin specialty, a beautiful blue enamel dial, created using the "grand feu" technique. The ladies version is available in 18 carat white gold with the bezel and lugs both set with round brilliant diamonds. Each piece has a White gold winding crown which is accented by a row of blue sapphire cabochons. The kiln-fired enamel dial is set with diamonds as well. 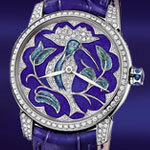 Each dial will be a unique creations produced by master artisan, each depicting images of delicate birds. Each watch is nicely complimented by a hand-sewn alligator leather strap. Each of the Classico watches feature a self-winding mechanical movements. The ladies' version displays hours and minutes, while the mens' version has a sweep seconds function and a rapidly correctable date display. Each timepiece is protected by a fitted curved sapphire crystals and the fine decorative finishing and 22 carat gold centrally-mounted winding rotors are visible through the sapphire crystal casebacks. The watches are completed with leather straps with 8-karat gold folding clasps. Check out this watch, here's something a bit different than your average Uylsse Nardin watch. 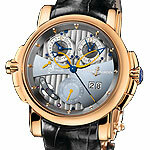 This astrology-themed timepiece, the Ulysse Nardin Moonstruck, is an interesting addition to the brands collection for 2009. This limited edition timpiece will be produced to only 500 pieces in both red gold and platinum. The Moonstruck display echoes the rotation of the Moon around the Earth, as well as the Sun’s relative position which is displayed by the two beautiful moon and sun shaped discs that are traveling around the large map of the Earth in the center of the dial. Ulysse Nardin has announced that the moon phase will reach 100,000 years before the display deviates from the proper phase. With a large case that measures dimensions of 46mm wide by 16.3mm thick, it is possible to incorporate the complex self-winding mechanical movement. The Moonstruck watch is powered by the caliber UN-106 movement, which is an in-house movement in its entirety - conceived, developed and manufactured all at Ulysee Nardin. The movement allows for approximately a 50 hour power reserve. The watch displays Hours and minutes and has an instant time-zone adjuster with a patented quick setting device. The picture of the earth has been hand painted on a mother of pearl dial which is then protected by an anti-reflective sapphire crystal. The superb case construction and its screw down security crown allows for a water-resistance of up to 100 meters. 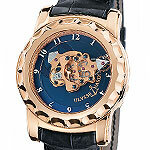 The Ulysse Nardin Moonstruck Watch is completed by an alligator leather strap with a folding buckle. Giving Patek Philippe and Vacheron Constanine a run for their money, Swiss watchmaker Ulysse Nardin has unveiled a new watch that displays a beautiful cloisonne enamel dial. 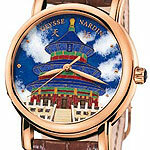 This new San Marco timepiece is called the "Temple of Heaven". Finding its inspiration from a famous group of Chinese buildings constructed during the Qing Dynasty in the 15th century, the dial depicts the Hall of Prayer for Good Harvests. 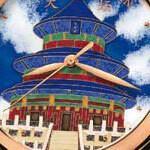 Each Temple of Heaven dial has been specially created for the watch and is a unique work of art. Michel Vermot, who is Ulysse Nardin's master of cloisonne enamel, takes well over 50 hours of work to complete each masterpiece. This highly collectible watch will be available to watch collectors in a very limited number. With only 36 timepieces of the Temple of Heaven in 18-karat rose gold and just 18 timepieces in platinum. Each watch will be individually numbered, which can be viewed on the affixed medallion on the left-hand side of the case. The watch has a 40 mm case with a sapphire crystal exhibition window on its case back which makes for easy viewing of its self-winding UN-13 movement with its guilloche 22 karat gold rotor. 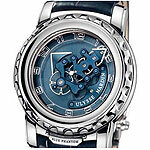 The Imperial St. Petersburg is the latest timepiece to join the Ulysse Nardin Marine Collection. Released as a limited edition of just 30 platinum pieces, the watch alone is only half of what makes this release so special. The watch will be housed in a unique multi-layer white translucent enamel Egg of the Tsars that has been adorned with 4.25 carats of diamonds. 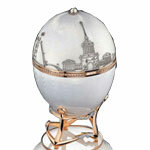 The eggs exterior uses these diamonds to recreate well known symbols of St. Petersburg, such as the Arch of the General Staff Building, the Rostral Columns, and the Admiralty Spires. 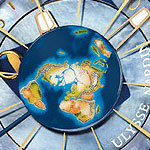 The egg has been placed on a white marble base, linked by a gold Ulysse Nardin’s anchor. The watch itself has a hand-crafted oven-cured enamel dial which is crowned with an applied gold double-headed Eagle which is the emblem of St. Petersburg. The movement used is the C.O.S.C chronometer certified UN-26 which has a 22 Karat gold rotor which is viewable through the watch's transparent case back. The Imperial St. Petersburg has hour and minute displays as well as a small seconds counter and a large date displayed at 6 o’clock. The movement allows for a 42 hour power reserve. 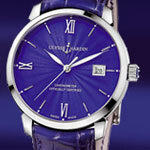 The case is 43mm in diameter and has a screw down crown and a sapphire crystal. The watch water resistant to 100 meters. The first Ulysse Nardin Freak was released in 2001, it included a 7 day-tourbillon-carrousel which went on to win the Chronos Innovation Prize for that year. This unusual watch had no hands or crown, and the constantly revolving movement gave the indications for time. The hour indicator is located on the mainspring barrel and the lithe escapement bridge acts as the minute indicator. The name FREAK started out as a secret code name for the project, in the end the name stuck as the watch was such a departure from conventional watch-making. The innovation also included the all new Dual Direct escapement developed by Ludwig Oechslin. The development of the FREAK pioneered the use of silicium and showcased the unique abilities of silicium for the production of their escapement wheels. In 2007 Ulysse Nardin took the Freak a step further with the launch the Freak DIAMonSIL which included a new patented Dual Ulysse Escapement made out of diamond and silicium. This time Ulysse Nardin used diamonds in the development of the new Freak with the goal of increasing the maximum life span and protecting the mechanism against external stress. Advancements in technology have allowed for alloying the silicium with diamond. Making the freak the first timepiece with a synthetic nanocrystal diamond escapement grown on a silicium raw part. The Freak DIAMonSIL has a retail price of $128,000 and is produced in the limited number of only 28 pieces. 2008 brought another member to the Freak family, the Freak DIAMonSIL. Crafted in 18k White Gold with the bridges and metal parts treated with a stainless blue titanium based alloy. The watch has the Caliber UN-202 Dual Ulysse Escapement movement in silicium with a power reserve of 7 days. This version of the Freak has the recognizable Carrousel Tourbillon which displays hours and minutes. 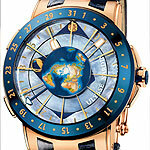 Horology moves leaps and bounds forward as new materials continue to help the industry evolve. With one of its newest creations, the Sonata Silicium, Ulysse Nardin makes use of silicium in both the appearance and movement of the watch. This limited edition watch is produced to 500 pieces in each 18 carat white and rose gold. Silicium, as it is not magnetic, is the ideal material for use in watch making. It is an extremely hard material at 1100 Vickers, which is 400 Vickers harder than steel. In addition it has a high resistance to corrosion. It is less reactive than its chemical analog carbon and does not occur free in nature. The Sonata Silicium's dial is cut out of a silicium wafer and the color untreated. There are three subdials, two white and one grey and the hands on the watch are blue and bright yellow. The case is 42mm and made from 18k white or rose gold and has a sapphire crystal case-back. The Automatic Ulysse Nardin Caliber UN-67 movement runs with a 28’800 A/h oscillator and an anchor escapement etched out of silicium. Both the anchor and escapement wheel are manufactured of silicium. The technical movement is similar to the the Sonata Cathedral Dual Time and includes the novel alarm setting with a countdown indicator.